On Thursday 1st November Stena Line is launching another fleet-wide donation campaign to support Mercy Ships – a charity organisation sailing around the world bringing free, life-saving medical care to where it’s needed the most. During the month of November, customers on all of Stena Line’s 38 vessels will be encouraged to Round Up for Charity. 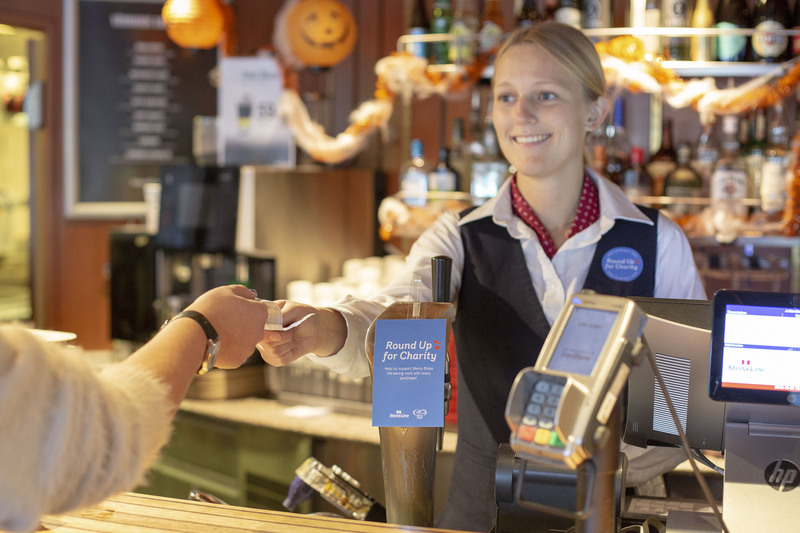 During the campaign period, 1 November – 27 November, Stena Line’s customers will be given the opportunity to round up their onboard purchases and make a donation to Mercy Ships. “We believe Round Up for Charity is a simple and effective way for our customers to help make a contribution to Mercy Ships’ inspiring work. Last year we managed to raise £11k during a two-month coffee campaign, and this year we hope to raise at least the same amount of money, in half the time”, says Niclas Mårtensson, CEO at Stena Line. The humanitarian non- governmental organisation and Stena Line became partners in February 2017. The aim of the partnership is to raise awareness of Mercy Ships, increase the interest for donations among Stena Line’s customers and partners, as well as promote volunteering with our employees to share their unique technical and naval competence. “In Mercy Ships, we have found a partner that is committed to helping those who need it the most, and like us see the benefits and the flexibility of having the ocean and ships as your workplace. This partnership is the most important part of our social sustainability initiatives, as it gives us an exciting opportunity to involve our employees, customers and partners in helping to make a difference. It also embodies our core value – care”, says Niclas Mårtensson. As a part of the partnership, Stena Line has also launched their own volunteer program. So far two Stena Line employees have volunteered on board Mercy Ships’ hospital ship Africa Mercy in Guinea, where hundreds of people have received free, life-saving medical care since the vessel arrived in August. “We are proud of and grateful to our employees who have chosen to volunteer for Mercy Ships and share their unique knowledge and naval competence. They have truly made a difference on board Africa Mercy, and their engagement is inspiring”, says Niclas Mårtensson. Mercy Ships is also pleased with the outcome of the partnership so far. “We are very happy with the partnership and the Round Up Campaign is yet another creative initiative Stena Line has started to help drive interest and awareness of Mercy Ships, as well as raising funds for our great cause”, says Tomas Fransson, National Director Mercy Ships Sweden. The month-long campaign ends on Tuesday 27 November, a date which marks this year’s #GivingTuesday – a charity equivalent to Black Friday and Cyber Monday, where instead of shopping you are encouraged to make a charity donation. #GivingTuesday is a global day of giving fuelled by the power of social media and collaboration, which is celebrated on the Tuesday following the widely recognised shopping events Black Friday and Cyber Monday. For more information please visit https://www.givingtuesday.org/.